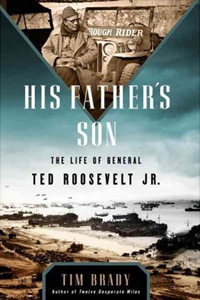 Tim Brady – His Father’s Son: The Life of General Ted Roosevelt, Jr.
June 5, 2017 – This day after this episode airs is June 6th, the anniversary of the D-Day landings in 1944. This week, our time machine hits those bloody beaches of Normandy, where we’ll meet the oldest man and highest-ranking officer to go ashore with the first wave: General Ted Roosevelt, Jr.
As the oldest son of President Theodore Roosevelt, Ted had the name, the looks, the expectations — and the pressure that literally gave him headaches as a young man. So how did Ted avoid the pitfalls of that upbringing, to attain success in business, laurels in the First World War, and that crowning moment on D-Day, actions which earned him the Congressional Medal of Honor? Here to introduce us to the younger Theodore Roosevelt is Tim Brady, author of His Father’s Son: The Life of General Ted Roosevelt, Jr. Tim Brady is a Peabody Award-winning writer whose works include Twelve Desperate Miles and A Death in San Pietro . He has written a number of PBS documentaries, and helped develop the series Liberty! The American Revolution. Check out his author pages at Amazon and Penguin Random House.